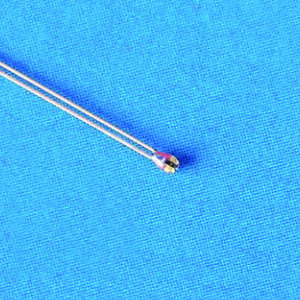 ATH10KR8B High-Stability-Thermistors - Analog Technologies, Inc. The ATH10KR8B is a high precision glass encapsulated thermistor. Comparing with conventional epoxy encapsulated thermistors, ATH10KR8B presents higher long term stability and wider temperature range. In addition, it has a small size and short response time. In addition, there are two insulation versions available, one of which comes with leads covered by plastic tubing, the ATH10KR8BT65, and the other one, the ATH10KR8BT65S, is sealed between the head and the tubing. They can work under up to 140°C temperature and the latter is of liquid resistant. Note: Free samples of thermistors at most 3 can be given after application and its approval. Free sample application will need the follow information: contact name, company name, company website, company email, work phone number, and potential usuage volume.